as shown in the Topic menu on the left. R. V. Roger Ltd, The Nurseries, Malton Road (A169), Pickering, North Yorkshire, YO18 7JW - Tel:(01751)472226 - Fax:(01751)476749 is a traditional third-generation family-run nursery, with the emphasis on plant quality and first-class customer service. The range of field-grown fruit trees grown is one of the best in the country, including many traditional varieties, which are becoming quite rare. They also grow over 40,000 roses in nearly 300 varieties. The rose field is usually in flower from the middle of July until the autumn, when you are welcome to visit and walk through the field. Besides shrubs and ornamental trees, R. V. Roger also produce four bulb catalogues throughout the year, offering choice for a plant or plants by mail order direct from the 280 acre nursery. DeerProofBulbs.com is an effort put forward by avid gardeners, writers and landscape designers with the hope of giving them the knowledge on how to keep deer out of gardens, and keep deer from eating flowers. "If you grow Gladiolus for exhibition, cutting, flower arranging or home decoration, then you can join the British Gladiolus Society. This international society was founded in 1926, its objectives are to stimulate interest and promote cultivation, breeding and improvement of the Gladiolus. To issue publications concerning Gladiolus and other items of interest to Gladiolus growers, and to encourage worthy new cultivars and to preserve older ones. To regulate the nomentculture, classification and registration of Gladioli, to hold exhibitions of the flower and to co-operate with other organisations pursuing the same objectives. Members benefit from the advice and experience of successful growers both in the United Kingdom and abroad. " from British Gladiolus Society. Gladiolus as Cutflower in Subtropical and Tropical Regions by J.C.M Buschman of the International Flowerbulb Centre Parklaan 5, P.O. Box 172, 2180 AD Hillegom - Holland is well worth reading especially if you are going to grow your dahlias on Chalk soil. Winter Bulb refer to when the bulbs are delivered to you, by R.V. Roger not when they flower. Gladiolus growing in the foot hills of Himalayas cultivation details. 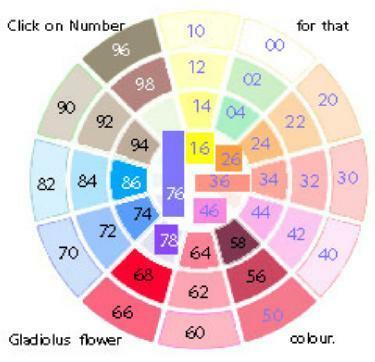 See Introduction Page for Colour Classification Code details. Gladiolus in Gladiolus Bulb European A-E, F-M, N-Z Galleries for those classified by The British Gladiolus Society, or Non-Classified Gallery. Nigel Coe from the British Gladioli Society has kindly let me use his photos. If a mail-order nursery from the UK is prepared to donate the use of their photos of the flower, foliage, overall plant, corm, flower arrangement, floret or award photo of any of their mail-order gladioli to this website, then more information can be provided with the existing gladioli from Europe and new ones added and compared. There are more than 600 Classified Code Gladioli in the list from the British Gladiolus Society and over 2500 in the classified list from the North American Gladiolus Council. This gallery and the other Gladioli galleries in this website were set up to detail and compare all those Gladioli. No nursery from the UK, America, India or Australia has donated their photos from January 2012 to July 2015. I apologise that unlike the clothing industry who display their wares, that nurseries seem to only want to grow and not to inform the public about their plants for sale. If Peeters Enterprises Gladiolus , Pleasant Valley Glads & Dahlias , Honker Flats or other mail-order nursery from America are prepared to donate the use of their photos of the flower, foliage, overall plant, corm, flower arrangement, floret or award photo of any of their mail-order gladioli to this website, then more information can be provided with the existing gladioli from America and new ones added and compared. Antanas Markevieius from Lithuania has kindly allowed me to use the photos from www.geles.biz, where he sells some Russian varieties as well as his own. If you want to buy the corms to grow in Lithuania or for export to your garden in your country, please contact him prior to middle of November each year. Lithuania became independent from Russia on 11 March 1990. The gladioli that he has registered with the North American Gladiolus Council are listed and linked to his website in the Cultivar from Russia / Lithuania Page. He has very kindly stated that he will provide the flowerhead height of his gladioli, so that I can create the relevant Gladiolus Description Page and then add them to the comparison pages and then they will appear in the next row. Gladiolus are grown and hybridised in Australia and when a mail-order nursery donates the photos and cultivation details together with the specific climactic conditions appertaining to the gladioli that they have hybridised, then those can be added to the row below, together with their Gladiolus Plant Description Pages and comparison pages for those that they can export to you for your own garden in Australia and perhaps other countries. The Integrated Sustainable Energy and Ecological Development Association (INSEDA) is the national India organization formed by the grassroots NGOs who had been involved in the promotion of renewable energy, ecological and natural resources development programmes with special focus on the implementation of biogas development in rural areas of the country, since 1980. They have hybridised some new varieties - see Gladiolus Bulb Site Map. These Gladiolus are grown in India and if a mail-order nursery donates the photos and cultivation details together with the specific climactic conditions appertaining to the gladioli that they have hybridised, then those can be added to the row below, together with their Gladiolus Plant Description Pages and comparison pages for those that they can export to you for your own garden. Site design and content copyright ©January 2012. Page structure amended November 2012. Thumbnails added to above Index October 2015. Chris Garnons-Williams.